My gorgeous Goddaughter Poppy and her family live in Kachin state in the north of Burma, close to the Chinese border. The capital of Kachin, Myitkyina, sticks in my mind as the place with the highest HIV prevalence I’ve ever seen in routine surveillance data: over 80% in drug injectors throughout most of the 1990s. 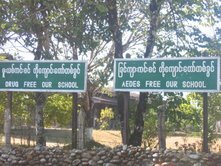 So I’m glad to see that the school in Poppy’s village has gone AEDS free. One hopes their teaching on drugs is better than their teaching of English grammar and spelling. Photo by Catherine Eccles, for which thanks. This post was published on 29/02/08 in Gallery. Tags: AIDS, Burma, HIV, Myanmar. What I see on the sign in the photo is not “AEDS FREE”, it’s “AEDES FREE”–speaking of injectors. The actual diseases that need to be vanquished is ignorance, and corrupted politicians. Ignorance is only bliss when you don’t want to know from someone’s fart, what is the last content of his food.